Will Ukraine crisis hasten decline of Russia's global image? The Ukraine story no doubt has many acts still to play out, and what started in Crimea may yet spread to eastern Ukraine. Although the ultimate response from the West remains unclear, it already seems likely there will be few if any winners from this sorry episode. And regardless of what happens in the coming days and weeks, it is already apparent that the crisis has taken its toll on some key players in the court of international opinion: Russia, Russian President Vladimir Putin, Western solidarity and U.S. President Barack Obama. Global publics were already divided in their view of Russia before the Ukrainian incursion – just 36 percent had a favorable view of Russia, while 39 percent saw it unfavorably in a 2013 Pew Research Center survey of 38 nations. In that poll, just 37 percent of Americans had a positive take on Moscow, while 43 percent saw it negatively. A subsequent, early February 2014 Gallup survey found that 60 percent of Americans had an unfavorable opinion of Russia. Public judgment of Russia in much of neighboring Europe was even harsher: Almost two-thirds of French, 60 percent of Germans and just over half of the Poles surveyed gave Russia a thumbs down in 2013. Much of the opprobrium toward Moscow last year reflected the relatively negative sentiments of those 50 years and older. Only 29 percent of Americans and Germans in this category, and just under a third of French saw Russia favorably. In contrast, half of Germans age 18 to 29, and almost half of young Americans held a positive view of Russia last year. This youthful approval may ultimately be what Putin’s move has put at risk. After all, this is the next generation of Western voters and decision makers – young people who before the Crimean takeover were predisposed to see the Cold War as ancient history and to give the new Russia the benefit of the doubt. The broad deterioration in Russia’s image may mean this is no longer the case, and Putin’s public standing in the West is also on the line. In 2012, just 28 percent of Americans had confidence in Putin to do the right thing in world affairs, while in Germany just under a quarter had confidence in him; in Britain it was one in five and in France a lowly 12 percent. These low levels of confidence were already down a whopping 53 percentage points in Germany, 36 points in France, 32 points in Britain and 13 in the United States since 2003. Putin’s handling of the situation in Ukraine, and broad Western skepticism, suggests that his numbers may dip further in the West. In an early March survey by Infratest dimap for German public broadcaster ARD and newspaper Die Welt, just 15 percent of those polled said Putin was a reliable partner. Most of the rest said they believed that he would use any means at his disposal to promote Russian interests. Of course, just because Russia and Putin have discredited themselves in the eyes of Western publics doesn’t mean that Europeans and Americans see eye-to-eye on what to do about Ukraine. Indeed, the much-vaunted spirit of Cold War solidarity seems conspicuously absent on the eve of what some analysts are dubbing a new Cold War. Only 29 percent of the American public wants Washington to take a firm stand with the Russians on Ukraine, according to a new Pew Research Center survey, while more than half say that it is more important for the U.S. government to not get too involved in response to the situation. A separate new CNN survey asked different questions, but found much the same public reluctance to do much. 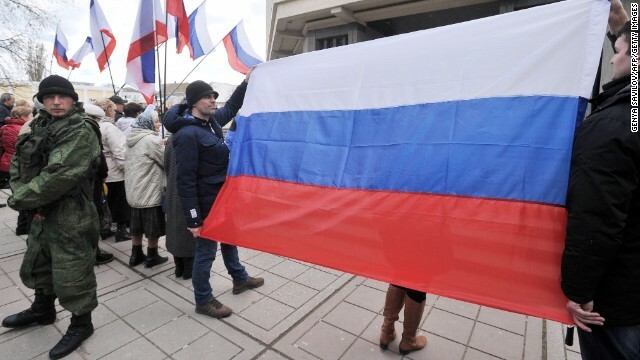 Roughly six-in-ten Americans in the CNN poll said they would support economic sanctions against Russia, but only 46 percent back economic aid to Ukraine and only a quarter supported military assistance. The numbers in Germany suggest even greater wariness among the public there – just12 percent of Germans back military cooperation with Kiev, according to an early March survey by Infratest dimap for ARD and Die Welt, while only two-thirds said they favor economic sanctions against Russia. Moreover, three quarters opposed excluding Russia from the G8 group of advanced economies and 92 percent opposed severing diplomatic relations with Moscow. President Obama, meanwhile, has also not weathered this storm well in terms of public opinion. Just 30 percent of Americans approve of the Obama administration’s handling of the situation involving Russia and Ukraine, according to the Pew Research survey, with 44 percent disapproving. True, the crisis in Ukraine is not about Putin or Obama. It is not about Russia’s image or the Western alliance – it is about the integrity and national sovereignty of Ukraine. And Kiev has the most to lose. Yet public opinion data suggest there may well be other global casualties from this crisis. And the perceptions of the actors involved in the future may depend very much on how the situation in the Ukraine unfolds in the coming days and weeks. Next entry »Are more food protests around the corner? « Previous entryWhat I'm reading: Will Russia make a play in Kazakhstan? Was Jeffrey Delisle, the Jewish Man who got caught red-handed when he was about to sell Canada's very-top current and future Military secrets to Russia, only for Seventy Thousand Dollars. Ukraine's interim president points out the existential threat of his country, although it is protected by the Budapest Memorandum of 1994. It gave up its nukes in exchange for protection. If the West can't honour this agreement, how can it expect Iran and North Korea to give up their nuclear ambition. Go Crimea. The world is behind you. Life, liberty and the pursuit of happiness is close. The world does not recognize the self imposed criminals in Kiev or the criminals in Washington that supports them. Very well put, Kevin. Thank you. And now tomorrow Kevin, will you & Marine below deport yourselves there or to Russia seeing that you like it so much; and seeing that you think freedom as in (West) is too free for you!!! PS, My prediction here & now is that Putin himself will be overthrown this year or be banished, this sorry excuse for a person never mind a Leader has put himself into a hole with his idiotic invasion stunt & now can't get out of it or is too proud to do so. The silent majority of people there that dislike him or in fact hate him being their leader will lose their fear of him & his thuggish FSB/etc & will give him & them the boot. Putin by the day exercising outside his boundary, his might; will bring closer the day when his people will exercise (collectively) for their "Rights"! Hopefully this will not be the case. The whole world needs someone like Russia to stand up to those horrific bullies in Washington. These people in Washington ruin everything! Russia has a long history of massacres, deportations, wars, ethnic cleansings, human rights abuses etc. More so, than any other country. There are other countries with similar checkered history in their past (including many in the West). So, will this situation somehow change their global image? Maybe for those who are still young and know little of history. But for those who are familiar with history, nothing has really changed. Russia is still the same oppressive regime it always was. It will continue to do so, so long as there are power hungry corrupt rulers like Putin. I say let the Ukranians decide what they want to do with their country (including Crimea region). Neither Russia, nor the West should interfere with internal affairs of the Ukranian people. And therein lies the problem Ferhat. Ukraine is not at all alone in it's financial/economic troubles, and no one is going to step up to bail it out. Firstly, all politics and governments are corrupt to some degree, with some obviously being much more so than others. How many countries in the last 20 years or so have NOT had issues with it's government? And of they haven't had serious enough issues, well by golly that can be attended to by other foreign countries and governments creating problems for them right quick. Who the flying duck was forcing the Ukraine government to take a one sided stance with either Europe or Russia in the first place? What a crock of horse manure! I don't see the likes of Mexico or Australia or whomever else being forced up against the wall in a similar situation? The Ukraine situation started out corrupt and just seems to be getting more and more corrupt. There's no democracy, no voting, and no real attempt at civilized resolutions. Start a protest, turn it into a revolt, oust the elected government, plant some unelected leader (goodness whom or why), and watch another neighbouring country just waltz in and chop out a share for itself, all being done under the real threat of violence, bloodshed, bankruptcy, failure, and war. If this isn't some monstrous form of terrorism, I don't know what is. Whether through the indirect threat of money, politics, and propaganda, or through the more direct threat of brute force, the Ukraine has quite simply been terrorized into now surrendering it's entire country. Russia's global image is a guy squatting in a track suit while smoking and drinking a 40. Does Putin care what the West thinks? What about the rest of the world. I am sure they are over-joyed to see someone stand up against American and EU bullying and a naked attempt to over throw the elected government in Ukraine. The long list of disasters imposed on people by the US and the EU should have been a warning for the anti-Russian Ukrainians: the former Yugoslavia, Iraq, Afghanistan, Libya and Syria just to name a few. Please, not so much falsities in your falsities! Obama certainly makes it very clear by receiving Yatsenyuk that the US backs criminals. Yatsenyuk ordered the snipers to shoot on both the police and the protesters to aid his coup. Since the destabilization of Ukraine was long planned – according to Nuland the US spent $5b on it – and the footprint of the CIA using neo-Nazis to cause havoc including one Chechen fighter, is all over that putch, the US certainly affirms that it will not hesitate to use Mafia tactics to fight for its completely illegal and criminal interests. And surely, the US does not show any respect for human rights: in Syria, 130'000 plus people were killed by militants, trained, armed and paid by the US; about 100 people died in Ukraine from sniper fire advised and condoned by the US. Obama should be impeached and tried in the Hague for crimes of war, crimes against humanity and genocide. The problem is the US does not recognize the Hague Court for its citizens. But you are right. Clinton, Bush and Obama should all be up there sitting in the box. The funny thing here is that Obama was awarded a Nobel prize for PEACE! And after that the guy goes and arranges all this mess in Ukraine. Incredible. Look at all the polls the author cites – but why is he silent about the taped conversation between Estonian foreign minister Paet and Catherine Ashton in which Paet informs her that the opposition ordered the sniper fire on the protesters and police, not Yanukovich? Ironically, the western press never published that tape. It was published on youtube and in the independent press. The snipers were sent by Putin...in the guise then as something other than "Little Green Men". You are wrong. It is a proven fact the snipers were sent by the new government. That's why the EU and the US did not investigate it. If it were not for the tapped phone call, nobody would have ever known about that and they would not have to investigate. This is Obama's chance to save face after red lining and blue lining empty promises and threats in Syria that has allowed the mad doctor to continue to kill his people with aid from Putin and Iran. The author says, "what started in Crimea may yet spread to eastern Ukraine". That's not the worst that can happen as it can spread to much more distant places. The old patriarchial world (Kremlin is about the last piece of it) is desparately fighting for its survival; the Crimea and Ukraine just happened by chance to be the starting point for the battle. And what's this Churkin the Russian Ambassador to the United Nations, oh "Russia don't want War". Well why did they invade Ukraine then & with such a pathetic excuse? We are "Saviours" of the world. They said that about Syria & we all know what happened since, don't we...?! It will not spread anywhere. This is just speculation. As long as your throwing around % on Google March 2014 Trends RT 99% vs CNN International 4%. The % of difference cause could be Journalistic standards. nuke ukraine they are sellouts many people say that islam wants to convert the western world thats wrong islam wants to nuke the entire western world kill all the people of usa britain ireland norway sweden germany australia brazil sooner or later a huge light will boil the entire western world to in a sea of flames a huge electro magnetic radiation and its game over all of the western world women children babies will burn to ashes if the slavic world wants to protect the western world then islam is going to nuke the entire eastern europa also including the chechen people and azerbaijan. The worst global image have: Chinese and Koreans. Russia did a great job on democracy and pro-western style business management. How about America's global image? After all, it's not Russia that has become the most hated nation in the world today, ours did! We're the ones butchering people in Afghanistan, Pakistan, Somalia and Yemen with those ungodly drones of ours, not the Russians. Finally, which country is the only one to ever drop the atomic bomb? Not Russia! You must be from like 1% of americans who actually have a brain. Everyone else seems to be blonded by ireational hate for Russia. To those ppl I have to say – judge and be judged. Thank you, John. In the Bible, Jesus once told a crowd who was about to stone a woman to death, " Let him who has never sinned cast the first stone" and we Americans love to cast a lot of stones through our own arrogance and self righteousness, especially at the Russians and Muslims! Actually, it just 'seems' like most americans are war mongering people who buy the media hype, but the truth is far different. Most people I talk to are tired of all the posturing and rhetoric in washington as well as how much we spend rebuilding countries we shoot up. Most Americans would rather bring our troops home and have the Army core of Engineers building roads here in the US, not Iraq, Afganistan, Syria, Ivory Coast, Libya, ..... Most Americans are sick of all the money our politicians are spending on war. Most people are frustrated to the point that we would like to give Peace a chance. War is not sustainable, Peace is. Unfortunately, the politicians believe that if you can keep the people distracted with a war, their chances of re-election are greater than if they look inword to see what the politicians have done for them at home. Bang the war drums so everyone looks somewhere else. However, we have soo many disabled veterans from the recent wars (prosthetic limbs, post traumatic stress disorder, ...). We the people are fed up with the war mongering politicians and would like to give Peace a try. This is the real America. Unfortunately, when americans like myself try to post on the heavily edited media outlets like ABC, our honest coments are almost instantly scrubbed - so you think the US is behind our politicians and ready for war - that is NOT the case - we are NOT - we would like to save some money, stop destroying buildings/roads/families and give Peace a try. It seems Putin doesn't need any help to be hated as he is the pursuer of all that by himself...now a good number of Russian people by their protest against Putin's invasion in Ukraine today numbering (50.000) are beginning to see the Kremlin for what it is an adulterated propaganda machine. In the next weeks when the majority of Russians join the 50.000 that marched today, then the Kremlin will implode in on itself & it won't be a minute too soon. PS. People like me don't hate the Russian people...but hate the Dictatorship in the Kremlin & Duma & Mafia & Security apparatus within that country. And the fact of the matter is when a government/dictatorship has to make new oppressive laws every week in their parliament without any opposition, then it shows they have a fear of "Fear" itself. Here we go. Most Americans are tired of their government foreign policy, and still, nothing changes in it. Is that democracy? What alluring image US and its president has all over the world.The world is not US and Europe alone.One can understand Russias interest in Ukraine.But what prompted U S to install a Neo Nazi regime in Ukraine.All terror outfits all over the globe are either nurtured. abetted or funded by US to overthrow legitimate elected governments,They directly attacks or through terrorist do proxy war against nations with an eye towards their resources.Now they find a match in Putin.Putins Russia is not Iraque .Libia or Syria.The US that got defeated by Vietnam farmers can do nothing more than chanting the cliche "sanction"
The Ukrainian Parliament voted this government into power as an interim government...until real elections take place in May. Also the President of Greed/Power & Corruption Yukonovych fled with as much as he could save of his stolen Billions because he knew his time was up & even Putin said said as much in a Press conference on the 4/3/22014, his first words since he invaded Ukraine. PS. Now yesterday, Putin has shut down all the Press/Media in Russia... except those who promote his propaganda speake, doesn't say much for "Truth" does it?! Mr. Stokes - You got an important fact backwards. It's NOT true that "only two-thirds [of Germans] said they favor economic sanctions against Russia." Rather, almost two-thirds OPPOSE such sanctions. Here is what your link says, citing the raw data of the poll: "An opinion poll has shown that the overwhelming majority of Germans is against the imposition of economic sanctions on Russia over its Ukraine policy... The poll said only 38 percent of respondents viewed economic sanctions as a suitable instrument to change Russia's stance." Putin is stoking up the violence by his own Russian Pro Fascists in Ukraine especially in Donetsk & Simferopol & it's known that thugs from Russia are being bussed in to support the trouble & to cause trouble. All this is because Putin wants to get an excuse to take over all of East-Ukraine. Well...the Ukrainians are anything but islamic, bar the Tartars now living in the Russian occupied Crimea, and Putin is not standing up against any bully but trying to get some more elbow room at the bully convention he, and others, is currently attending. And the rest of us, middle of the road people, will continue to stay in the sorry state we currently dwell in as long as we'll let others speak for us. I understand why too many of us are so disheartened but this is exactly where the bullies want us to be and the longer we stay here the harder it will be for us to climb out of here. So get hold of your shoe laces, pull yourself up and let's go. Don't ask/wait for guidance. You already know, deep in your hearts, what is it that you have to do. Very interesting points you have observed , appreciate it for putting up. "Whatever we conceive well we express clearly, and words flow with ease." by Nicolas Boileau. Simply wanna input on few general things, The website pattern is perfect, the content is very excellent : D.